In his illustrated 1753 treatise "The Analysis of Beauty," Hogarth argued that aesthetic appreciation was not just the preserve of the elite connoisseur but belonged as well to the average person, and he drew on everyday life and often comic examples to democratize the artistic enterprise. Hogarth's best-known works depicted the poverty and moral squalor of eighteenth-century London. His visceral pictorial dramas not only mirrored London street life but inferred many of the causes of social ills in politically charged art that challenged class, gender, and racial inequities in an age of British colonial expansion. Hogarth satirized the pretensions of politicians, industrialists, and clerics, but also sympathetically depicted the "common people," specifically working women: seamstresses, milkmaids, fish-girls, and other occupations. 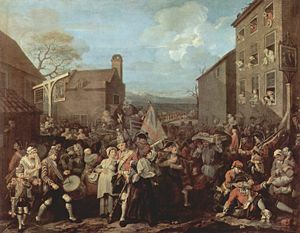 Much of Hogarth's work was plainly didactic, for example the series Industry and Idleness (1747) and the diptych Beer Street and Gin Lane (1751), which presented the stark choice between good and evil. The son of a poor school teacher and textbook writer, William Hogarth was born at Bartholomew Close, in London, on November 10, 1697. In his youth, he was apprenticed to the engraver Ellis Gamble in Leicester Fields, where he learned to engrave trade cards and similar products. He disliked the drudgery of copying the designs of others, however, and after seeing the late baroque paintings at Saint Paul's Cathedral and Greenwich Hospital, he conceived of an ambition to become a history painter. Hogarth also took a lively interest in the street life of the metropolis and the London fairs, and amused himself by sketching the characters he saw. During his apprenticeship Hogarth developed a system of visual mnemonics, a strategy to improve his memory that enabled him to recall people and scenes which had made an impression on him. Around the same time, his father, who had opened an unsuccessful Latin-speaking coffee house at St John's Gate, was imprisoned for debt in Fleet Prison for five years. Hogarth never talked about it, and his father died in 1718, "disappointed by great men's promises" to subscribe to a projected Latin dictionary. Hogarth went into business as an engraver in 1720, at first engraving coats of arms and shop bills, and designing plates for booksellers. That same year Hogarth joined the St. Martin's Lane Academy to pursue he ambition as a painter and in 1724 he published his first independent print, "Masquerades and Operas, Burlington Gate," an attack on English subservience to foreign art. In 1727, he was hired by Joshua Morris, a tapestry worker, to prepare a design for the Element of Earth. Morris, however, heard that he was an engraver, and not a painter and consequently declined the work when completed. Hogarth accordingly sued him for the money in the Westminster Court, where the case was decided in his favor. Hogarth established a growing reputation as a painter of "conversation pieces." In 1729 he eloped with Jane Thornhill, the daughter of the artist Sir James Thornhill. Hogarth's series of moralizing prints, beginning with Harlot's Progress(1732), the Rake's Progress (1735), Marriage àla Mode (1745) and The Four Stages of Cruelty (1751), apparently reconciled him to his estranged father-in-law and confirmed his reputation as a gifted artist with mass appeal. Hogarth, like Charles Dickens a century later, found the sources for his art in everyday life, was an outspoken social critic, and produced a body of work that was accessible to Everyman, not just the educated and aristocratic classes. Hogarth's concern for the public welfare and humanitarian causes led to his appointment as governor of St. Bartholomew's Hospital and the Foundling Hospital. Often turning to the conditions of life of the young and laboring classes in his art, Hogarth also was a prolific painter of religious art commissioned for churches and public buildings. In his late years Hogarth gained a reputation throughout Europe and achieved financial security. In 1757 he obtained the appointment as sergeant painter to the king, the highest honor open to his profession. While work on his last print, the Bathos, he was taken ill and died at Leicester Fields on Oct. 25, 1764. Hogarth was buried at St. Nicholas's Churchyard, Chiswick, London, and his friend, the actor David Garrick, wrote the inscription on his tombstone. Early satirical works included an Emblematical Print on the South Sea Scheme (c.1721), about the disastrous stock market crash of 1720 known as the South Sea Bubble, in which many English people lost a large sums of money through speculation. Protestant, Catholic, and Jewish figures are shown gambling, while in the middle people are boarding a huge machine, like a merry-go-round. At the top is a goat, below which is written, "Who'l Ride," showing the foolishness of people investing in the scheme. The people are scattered around the picture with a real sense of disorder, which represented the confusion. Other early works include The Lottery (1724); The Mystery of Masonry brought to Light by the Gormogons (1724); A Just View of the British Stage (1724); some book illustrations; and the small print, Masquerades and Operas (1724). The latter is a satire on contemporary follies, such as the masquerades of the Swiss impresario John James Heidegger, the popular Italian opera singers, John Rich's pantomimes at Lincoln's Inn Fields, and finally the exaggerated popularity of Lord Burlington's protégé, the architect and painter, William Kent. He continued that theme in 1727, with the Large Masquerade Ticket. In 1726, Hogarth prepared twelve large engravings for Samuel Butler's Hudibras, which he valued highly, and are among his best book illustrations. In the following years, he turned his attention to the production of small "conversation pieces" (that is, groups in oil of full-length portraits from 12 to 15 in. high). Among his efforts in oil between 1728 and 1732 were The Fountaine Family (c. 1730), The Assembly at Wanstead House, The House of Commons examining Bambridge, and several pictures of the chief actors in John Gay's popular The Beggar's Opera. One of his masterpieces of this period is the depiction of an amateur performance of John Dryden's The Indian Emperor, or The Conquest of Mexico (1732–1735) at the home of John Conduitt, master of the mint. Hogarth's other works in the 1730s include A Midnight Modern Conversation (1733), Southwark Fair (1733), The Sleeping Congregation (1736), Before and After (1736), Scholars at a Lecture (1736), The Company of Undertakers (Consultation of Quacks) (1736), The Distrest Poet (1736), The Four Times of the Day (1738), and Strolling Actresses Dressing in a Barn (1738). He was long reputed to have printed Burlington Gate (1731), evoked by Alexander Pope's Epistle to Lord Burlington, to defend Lord Chandos, whom Pope satirizes. This print gave great offense, and was suppressed, although some modern authorities no longer attribute this to Hogarth. 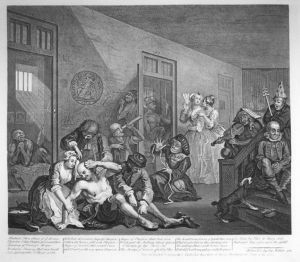 Many of Hogarth's more successful works were series of paintings and engravings that depicted a story of either redemption or degradation. In 1731, he completed A Harlot's Progress, the earliest of the series of moral works that won him recognition as an original artist. The series was destroyed by fire in 1755 but later published as engravings. In its six scenes, the miserable fate of a country girl who falls into prostitution in town is traced remorselessly from its starting point, the meeting of a bawd, to its shameful and degraded end, the whore's death from venereal disease and the following merciless funeral ceremony. 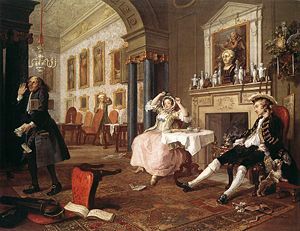 The series was an immediate success, and was followed in 1735, by the sequel, A Rake's Progress showing in eight pictures the reckless life of Tom Rakewell, the son of a rich merchant, who wastes all his money on luxurious living, whoring, and gambling, and ultimately finishes his life in Bedlam. A Rake's Progress is displayed in the gallery room at Sir John Soane's Museum, London. Marriage à-la-mode, Shortly After the Marriage (scene two of six). In 1743–1745, Hogarth painted the six pictures of Marriage à-la-mode (National Gallery, London), a pointed skewering of upper class eighteenth-century society. This moralistic warning shows the miserable tragedy of an ill-considered marriage for money. This is regarded by many as his finest project, certainly the best example of his serially-planned story cycles. Marital ethics were the topic of much debate in eighteenth-century Britain. Frequent marriages of convenience and their attendant unhappiness came in for particular criticism, with a variety of authors taking the view that love was a much sounder basis for marriage. Hogarth here painted a satire—a genre that by definition has a moral or didactic point to convey—of a conventional marriage within the English upper class. All the paintings were engraved and the series achieved wide circulation in print form. The series, which are set in a Classical interior, shows the story of the fashionable marriage of the son of bankrupt Earl Squanderfield to the daughter of a wealthy but miserly city merchant. The series starts with the signing of a marriage contract at the Earl's mansion and ends with the murder of the son by his wife's lover and the suicide of the daughter after her lover is hanged at Tyburn for murdering her husband. In the 12 prints of Industry and Idleness (1747) Hogarth shows the progression in the lives of two apprentices, one who is dedicated and hard working, and the other idle. The series depicts the work ethic of Protestant England, where those who work hard get rewarded, such as the industrious apprentice who becomes Sheriff of London (plate 8), Alderman (plate 10), and finally Lord Mayor of London in the last plate in the series. The idle apprentice, who begins "at play in the church yard" (plate 3), holes up "in a Garrett with a Common Prostitute" after turning highwayman (plate 7) and is finally "executed at Tyburn" (plate 11). The idle apprentice is sent to the gallows by the industrious apprentice himself. Later important prints include his pictorial warning of the unpleasant consequences of alcoholism in Beer Street and Gin Lane (1751). Hogarth engraved Beer Street to show a happy city drinking the "good" beverage of English beer, versus Gin Lane which showed the effects of drinking gin. People are shown as healthy, happy, and prosperous in Beer Street, while in Gin Lane they are scrawny, lazy, and careless. The woman at the front of Gin Lane who lets her baby fall to its death echoes the tale of Judith Dufour, who strangled her baby so she could sell its clothes for gin money. The prints were published in support of what would become the Gin Act 1751. Hogarth's friend, the magistrate and satirical writer Henry Fielding, may have enlisted Hogarth to help with propaganda for a Gin Act: Beer Street and Gin Lane were issued shortly after his work, An Enquiry into the Causes of the Late Increase of Robbers, and Related Writings and addressed the same issues. Other prints expressed his outrage against inhumanity. The Four Stages of Cruelty (1751) was a series which Hogarth intended to show some of the terrible habits of criminals. In the first picture, there are scenes of torture of dogs, cats, and other animals. The second depicts Tom Nero, one of the characters from the first painting, who has now become a coach driver. His cruelty to his horse caused it to break its leg. In the third painting, Tom is shown as a murderer, with the woman he killed lying on the ground, while in the fourth, titled Reward of Cruelty, the murderer is shown being dissected by scientists after his execution. The 1752 Act of Parliament had just been passed allowing for the dissection of executed criminals who had been convicted for murder. Hogarth was also a popular portrait painter. In 1746, he painted actor David Garrick as Richard III, for which he was paid £200, “which was more,” he wrote, “than any English artist ever received for a single portrait.” In the same year, a sketch of Simon Fraser, 11th Lord Lovat, afterwards beheaded on Tower Hill, had an exceptional success. Hogarth's truthful, vivid, full-length portrait of his friend, the philanthropic Captain Coram (1740), (patron of the Thomas Coram Foundation for Children, now Foundling Museum), and his unfinished oil sketch of The Shrimp Girl (National Gallery, London), may be called masterpieces of British painting. 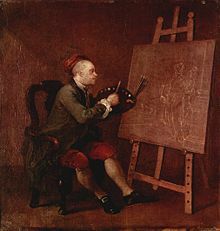 During a long period of his life, Hogarth tried to achieve the status of history painter, but had no great success in this field. Examples of his history pictures are The Pool of Bethesda and The Good Samaritan, executed in 1736–1737 for St Bartholomew's Hospital; Moses Brought Before Pharaoh's Daughter, painted for the Foundling Hospital (1747); Paul before Felix (1748) at Lincoln's Inn; and his altarpiece for St. Mary Redcliffe, Bristol (1756). he went to France, and was so imprudent as to be taking a sketch of the drawbridge at Calais. He was seized and carried to the governor, where he was forced to prove his vocation by producing several caricatures of the French; particularly a scene of the shore, with an immense piece of beef landing for the "Lion d'argent," the English inn at Calais, and several hungry friars following it. They were much diverted with his drawings, and dismissed him. Back home, he immediately executed a painting of the subject in which he unkindly represented his enemies, the French, as cringing, emaciated, and superstitious people, while an enormous sirloin of beef arrives, destined for the English inn as a symbol of British prosperity and superiority. He claimed to have painted himself into the picture in the corner, with the soldier running him in. March of the Guards to Finchley (1750), a satirical depiction of troops mustered to defend London from the 1745 Jacobite rebellion. Notable Hogarth engravings in the 1740s, include The Enraged Musician (1741), the six prints of Marriage à-la-mode (1745; executed by French artists under Hogarth's inspection), and The Stage Coach or The Country Inn Yard (1747). In 1745, Hogarth painted a self-portrait with his dog (now also in Tate Britain), which shows him as a learned artist supported by volumes of Shakespeare, Milton, and Swift. In 1749, he represented the somewhat disorderly English troops on their March of the Guards to Finchley. Later works included his ingenious Satire on False Perspective (1753); his satire on canvassing in his Humours of an Election|Election series (1755–1758; now in Sir John Soane's Museum); his ridicule of the English passion for cockfighting in The Cockpit (1759); his attack on Methodism in Credulity, Superstition, and Fanaticism (1762); his political anti-war satire in The Times, plate I (1762); and his pessimistic view of all things in Tailpiece, or The Bathos (1764). Hogarth also published theories of visual beauty and grace in his book The Analysis of Beauty (1753), affirming that art should be accessible to the common man of his day. Prominent among his ideas of beauty was the theory of the Line of Beauty—an S-shaped curved line (serpentine line) that excited the attention of the viewer and evoked liveliness and movement. The Analysis of Beauty formed the intellectual centerpiece of what the historian Ernst Gombrich described as Hogarth's "grim campaign against fashionable taste," which Hogarth himself described as his "War with the Connoisseurs." Hogarth lived in an age when artwork became increasingly commercialized and viewed in shop windows, taverns, and public buildings, as well as sold in print shops. As old hierarchical authority and traditions began to break down, new artistic forms began to flourish: the ballad opera, the bourgeois tragedy, and especially, a new form of fiction called the novel with which authors such as Henry Fielding had great success. In the spirit of the time, Hogarth hit on a new idea: "painting and engraving modern moral subjects … to treat my subjects as a dramatic writer; my picture was my stage," as he himself remarked in his manuscript notes. He drew from the highly moralizing Protestant tradition of Dutch genre painting, and the vigorous satirical traditions of the English broadsheet and other types of popular print. In England, the fine arts had little comedy in them before Hogarth. His prints were expensive, and remained so until early nineteenth century reprints brought them to a wider audience. When analyzing the work of the artist as a whole, Ronald Paulson, the modern authority on Hogarth, sees an accomplished parodist at work, and a subversive. "In A Harlot's Progress, he says, "every single plate but one is based on Dürer's images of the story of the Virgin and the story of the Passion." According to Paulson, Hogarth is subverting the religious establishment and the orthodox belief in an immanent God who intervenes in the lives of people and produces miracles. Indeed, Hogarth was a Deist, a believer in a God who created the universe but takes no direct hand in the lives of his creations. Thus, as a "comic history painter," he often poked fun at the old-fashioned, "beaten" subjects of religious art in his paintings and prints. 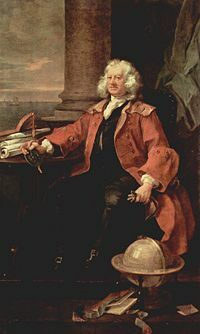 Hogarth also rejected Anthony Ashley Cooper, 3rd Earl of Shaftesbury's then current ideal of the classical Greek male in favor of the living, breathing female. He said, "Who but a bigot, even to the antiques, will say that he has not seen faces and necks, hands and arms in living women, that even the Grecian Venus doth but coarsely imitate." William Hogarth played a central role in establishing an English school of painting in the eighteenth century, both through the craftsmanship of his painting and through his long efforts to raise the status of the artist in England. His sharp, satiric critiques of English society were immensely popular and widely accessible, and were an artistic counterpart to such satirists as Henry Fielding and Jonathan Swift. Importantly, Hogarth gained commercial success by publishing engravings of his own paintings, thus enabling later artists to become independent of wealthy patrons. Hogarth also fought for legislation to protect artists' copyright, efforts that led to Britain's first copyright act was passed in 1735. Hogarth's paintings and prints have also been borrowed by later composers and writers. For example, Igor Stravinsky's opera The Rake's Progress, with libretto by W. H. Auden, was inspired by Hogarth's series of paintings of that title. Russell Banks's short story, "Indisposed," is a fictional account of Hogarth's infidelity as told from the viewpoint of his long-suffering wife, Jane. Hogarth's House in Chiswick, West London, is now a museum, abutting one of London's best known road junctions—the Hogarth Roundabout. His satirical engravings are often considered an important ancestor of the comic strip. A Hogarth tribute exhibition entitled, The Analysis of Beauty premiered in the "Noise" exhibition at Kettle's Yard gallery in Cambridge, UK, in January 2000 (where it was exhibited alongside work by Francis Crick and James Watson, Umberto Eco, Marc Quinn, and John Dee). The exhibition has since been appeared widely throughout Great Britain and (on video only) in the Sonar Festival in Barcelona. An early print by William Hogarth entitled A Just View of the British Stage from 1724. Bust of Hogarth, Leicester Square, London. ↑ William Hogarth, (J.B. Nichols and Son, 1833 Original from the University of Michigan. Digitized Aug 24, 2006 Anecdotes of William Hogarth, Written by Himself. googlebooks Retrieved April 24, 2008. Antal, Frederick. Hogarth and His Place in European Art. London: Routledge & K. Paul, 1962. Ogee, Frédéric and Peter Wagner, eds. William Hogarth: Theater and the Theater of Life. Los Angeles: William Andrews Clark Memorial Library, 1997. Paulson, Ronald. Hogarth's Graphic Works. New Haven: Yale University Press, 1970. Quennell, Peter. Hogarth's Progress. New York: Viking Press, 1956. Simon, Robin. "Hogarth, France and British Art: The Rise of the Arts in Eighteenth Century Britain." The New York Review of Books 54 (11) (2007): 16. Wagner, Hans-Peter. William Hogarth: Das graphische Werk. Dresden: Sachsenverlag, 1950. All links retrieved March 3, 2014. 'Hogarth's London', lecture by Robin Simon at Gresham College, 8th October 2007 (available for download as MP3, MP4 or text files). Hogarth exhibition at Tate Britain (7 Feb-29 April 2007). This page was last modified on 3 March 2014, at 16:10.